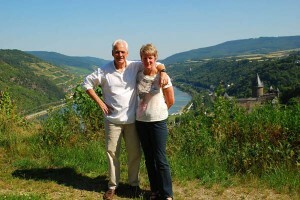 Thank you George and Susan for placing your full faith and trust in European Focus Private Tours to fulfill George’s “Bucket List” of places he wanted to visit in Germany. It was an honor! Here are two new members of the growing European Focus Family high above Bacharach, Rhein Valley, on their final day of their tour. See you again on this side of the Atlantic!